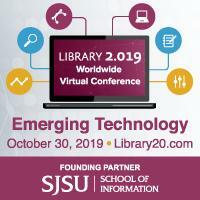 The San José State University School of Information is organizing three Library 2.0 web conferences during 2019, each focusing on a specific topic addressed by experts in the information profession. The conferences will be held entirely online and registration is free. The format includes an opening keynote panel, concurrent crowd-sourced sessions and a closing address. Abstract: Local, state and federal governments are releasing data, the public’s data, in new ways. Property maps, 311 data, school quality information and census statistics — all of these are examples of open data that give people the tools they need to learn and advocate for their causes. This free web conference will explore how librarians are using open data, teaching others about it, and even creating it. You’ll learn about tools you can implement in your own library and hear stories from libraries that have partnered with their local and state governments. Armed with practical tools and experiences, you’ll be ready to start diving into open data to help your library and community! Please visit the conference website for more information, including the call for proposals, speaker biographies and registration. Abstract: Keep your library on top of the latest trends and technologies that are revolutionizing the way we live and learn. Virtual Reality, Augmented Reality, Artificial Intelligence, Machine Learning, Blockchain, Internet of Things, Drones, Personalization, the Quantified Self … the list goes on. Libraries can and should be the epicenter of exploring, building and promoting these emerging technologies, assuring the better futures and opportunities they offer are accessible to everyone. During this conference, you’ll explore current practices using these cutting-edge technologies, get new ideas for implementation, and discuss the possibilities for the future. Mark your calendar for this conference! The call for presentation proposals and registration will open in spring 2019. Abstract: Instructional designers, technologists, and online learning specialists are in high demand across all levels of education. In 2004, the Blended Librarians Online Learning Community was established to promote the adoption of instructional design and technology as a vital skill set for librarians seeking to more deeply integrate their teaching and learning initiatives into the curriculum and community. During this three-hour web conference, librarians, instructional designers and other educators will come together to discuss the integration of instructional design, educational technology, learning, and libraries, and explore how they can shape the future of libraries through the application of instructional design and technology. and what we can expect as instructional design and technology transitions from a peripheral to core function within libraries. This conference was held on March 13, 2019. Sessions were recorded and are available on the conference website.